RESCUE 2018 - Join With Us to Help Dogs in Need by Furry Friends Foster and Rescue, Inc. The year is just beginning, but there is no beginning or end to rescue. There is a continuum of dogs needing help. It is a day in/day out challenge for everyone involved. We have big plans for 2018 - we want to help MORE dogs in urgent need - but we can't do it without you! Every day we receive emails, telephone calls, and messages regarding dogs in need. Every day we do what we can to help, but all too often we are forced to say "no". We can only help if we have funding to ensure that we can provide any necessary care for each dog in our rescue - those already in our rescue, as well as new intakes. Currently, we are working hard to pay down our vet bill which is still above $10,000! We're making progress, but as we make payments, new charges are posted. With over 40 dogs currently in the rescue, ongoing care is expensive. We have numerous dogs in need of substantial, ongoing medical care, as well as providing regular care for all of our dogs. Therefore, we are sadly unable to take in any dogs at this time with urgent medical or behavioral needs. Turning away a dog we know needs us is the single hardest part of what we do. Because we WANT to say "yes" - we WANT to help - we WANT to provide a safety net for every single dog. We know we can't - we know we'll never be able to help them all - but we know we CAN, and we WANT to, do MORE! Our mission as a rescue, and the personal mission of every single one of us at FFFR, is to help the dogs who need us the most - those in danger of death from euthanasia, those badly in need of medical care, those frightened and anxious dogs in need of training and behavior modification. We are a small band of totally committed warriors, fighting against animal neglect and abuse, helping those who cannot help themselves, being the voice of the voiceless and hope of the hopeless. We cannot take on the world - but we CAN make a real difference, one dog ... and four paws ... at a time! In order to go forward with that mission, we need ALL OF YOU! As a small non-profit rescue, we are totally dependent upon donations from our friends and fellow animal advocates. We did so much in 2017! We helped many dogs who would have faced almost certain death - either from euthanasia, or because of serious medical and/or behavioral issues that would make them unadoptable - unless we had stepped in. In 2018 we desperately want to be able to do more - the need is never-ending. We cannot do that without your support! Every donation we receive - small or large or in between - makes it possible for us to save lives! Currently we have a number of dogs already in rescue who need substantial medical care. As a responsible rescue, we must ensure that we have funds sufficient to care for the dogs already in the rescue before taking on more medical expense. We need to pay down our vet bill and replenish our medical fund before we can take on any more dogs needing substantial medical care. ROCKY, the dog pictured in this fundraiser, came into the rescue from a local CT pound after his owners surrendered him because they were moving and couldn't bring him with them. He tested a strong positive for both Lyme Disease and anaplasmosis - another tick borne illness. He is a senior, and a full blood panel was required - not only because of his age, but also because anaplasmosis can cause severe anemia. He is being treated with antibiotics and is doing well. He also needs major dental surgery - he will need at least 12 teeth removed - possibly more. That surgery is scheduled for January 23. All together, his medical care will cost approximately $775.00. ANNETTE AND WILLOW, a bonded pair of seniors, came into the rescue from a hoarding situation in a local CT pound. Annette had severe fur loss, a voracious appetite, and other symptoms that were concerning. Blood tests showed that she has Cushings Disease. She is on medication and the condition is stabilized. Now that that has happened, she and Willow both need extensive dental surgery. All told, the cost will be approximately $1200.00. They are both scheduled for dental surgery on January 30th. CHICO came into our rescue as an owner surrender. He was saved from living in a basement by a woman with a huge heart, but little experience with dogs with behavioral issues, and limited financial resources. She reached out to us, and we did everything in our power to allow him to stay with her - including taking on responsibility for his medical care and associated costs. Chico was diagnosed with Inflammatory Bowel Disease - he is on several medications - azothiaprine, metronidazole, a B12 supplement, and a probiotic - as well as a prescription hydrolized diet which is extremely expensive at $99/bag! We also raised funds to send him to residential training to help him overcome his fear of new people and for socialization. Chico is doing well medically, aced his training, and is now living with a wonderful foster who, together with our rescue trainer, is making sure that he continues to progress behaviorally. To date, Chico's medical care, including diagnostic testing at our vet's office, an ultrasound at a specialty vet, medications and prescription food, and follow-up vet visits, has cost approximately $1,500. GEMMA came to us from a local CT pound. She was part of an abuse/neglect case - she was removed from the home along with 7 other dogs. She is about 10 years old and a gentle, lovable girl who just wants to leave her past behind her and go forward to enjoy all the good things life has to offer. Gemma has mast cell cancer. A large tumor - the size of the palm of a man's hand - was found on one of her legs when she went to our vet. She had a two-week course of steroids to shrink the tumor, and then it ws surgically removed. The biopsy showed that it is a very virulent form of the disease. There was also involvement of one lymph node. Our vet got good, clean margins - but because it had already spread, she will need an oncology consult and, in all probability, follow-up radiation. To date, our medical costs for Gemma have been approximately $1,300.00 - including two follow-up surgeries when her incision did not heal correctly. We ask that you consider helping us to help the dogs who are still waiting. Because they don't have forever. They have a short time to find the help they need. Won't you join with us in our mission - together we can do so much! You can donate directly through this fundraiser. Or donations can be mailed to us at: Furry Friends Foster and Rescue, Inc., 64 Thomaston Rd, Harwinton CT 06791. 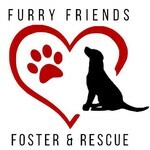 Furry Friends Foster and Rescue, Inc. is approved by the United State Internal Revenue Service as a 501(c)(3) public charity. ANOTHER way you can help! Just personalize and share a copy of our campaign. It's quick and easy to do!